If you're the manager of a self-storage facility and you want to rent more units and make more money, then this book is for you! While most of us are not "born salespeople," all of us can learn to be great salespeople. This book shares common-sense ideas and techniques to teach anyone how to succeed at self-storage sales. 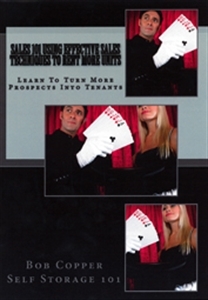 The skills in this book will enable you to turn more prospects into tenants, rent more space and generate more revenue.